This interview was first seen on The Sweet Setup and edited by Jeffrey Abbott. Some of my setups have changed or are subject to changes with time. I’m Chenyang Hsu, a law student living in Beijing. Aside from law, I’m fascinated with technology, especially related to internet and digital. I’m interested in facilitating everyday life with digital devices and am always finding methods to improve productivity. I find Apple products are good companions on my way to improve myself. In my free time, I work in student union in charge of the department of publicity where I can exploit my skills in digital designing with Photoshop, InDesign, and Sketch. The next goal for me is to learn video-editing skills. 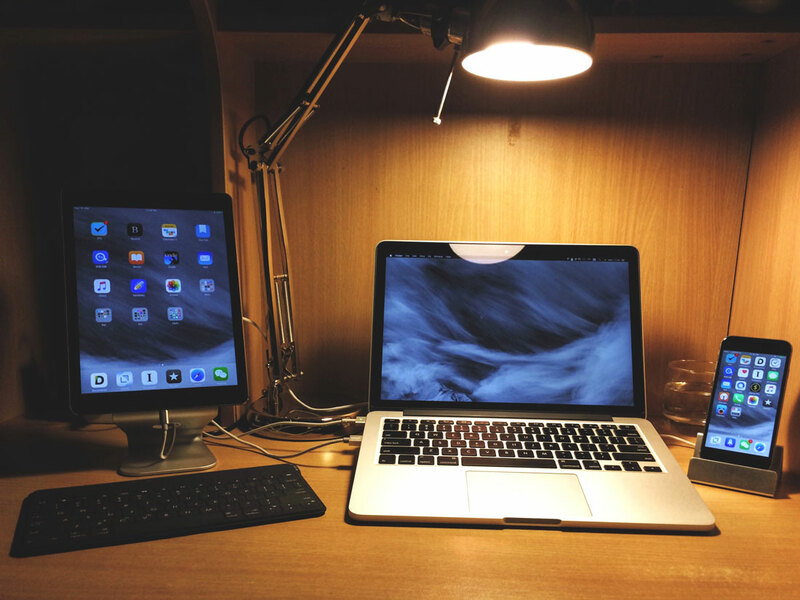 My current setup is an early-2015 13″ Retina MacBook Pro with 8GB memory and 256GB storage. In fact, I was using a MacBook Air until this July. I really love the Air’s thin and light design, but since all my other devices are Retina, it feels strange when I switch from iPhone to Mac, as if my eyesight is worsened; moreover, its color reproduction always deviates from what it is meant to be, which is disturbing for my design work. So, I decided to upgrade, and that turned out to be a wise choice. My Mac setup is companied with a Bluelounge Kickflip and an IKEA Forså lamp. The Kickflip lifts the MacBook at a subtle angle so it’s more ergonomic, and the Forså (with a soft-white light bulb installed provides a cozy and comfortable atmosphere in the chilly winter here in Beijing. I’m always trying to make my devices work together, and for that I can set a unified HD wallpaper for them. With thousands of stock photos, Unsplash is my first choice to find new wallpapers, including the current one. As mentioned above, I’m a student and amateur designer, so I have two sets of apps to get my work done. For school, I use PDF Expert, MindNode, MWeb and Pages. I have to read a lot of PDF documents for law school, and many of them are scanned versions, consisting of hundreds of pictures. PDF Expert is the only one I found thus far that shows no latency when scrolling between pages. Before I’m going to write something, I use MindNode to organise my thoughts and “draw” the outline down. I consider it the most simple but elegant app in the mind-mapping category. When ready to write, I always compose in plain text with Markdown syntax, and I chose MWeb as my Markdown app, which is made by a Chinese developer. I used to write with Byword, but updates are infrequent, and keyboard shortcuts, additional syntax support, and live preview are lacking for my use. I still write with Byword on iOS, but switched to MWeb on my Mac because it provides much more powerful functions at a reasonable price. As for designing, I use Inboard, Photoshop and Sketch. InBoard is an unified place to store inspiration I snipped from Bēhance and Dribbble. Photoshop is the creativity tool I use on a daily basis to make posters, bulletin boards, cards, etc., and its technology in bitmap processing provides infinite possibilities. But, when it turns to prototype or UI designing, Photoshop is slow and clunky. In those cases, I use Sketch instead, which is less powerful than Photoshop or Illustrator, but faster and way more flexible. I’m quite satisfied with my current setup because it keeps a great balance between performance and mobility. But, sometimes I still want a more powerful processer and a larger screen, so maybe one day I’ll upgrade to a 15″ MacBook Pro once I save enough money from my part-time designing jobs. 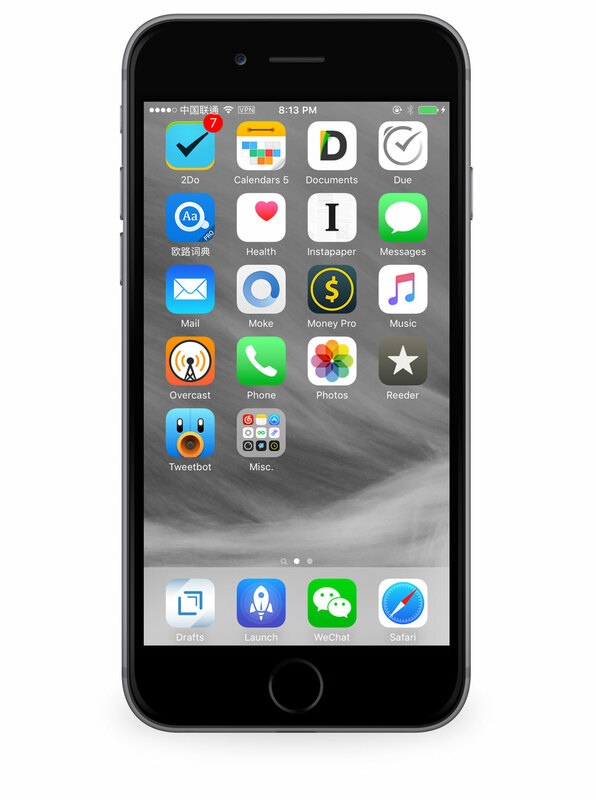 I upgraded to a 64GB iPhone 6s the day it launched, and I found its faster A9 chip and 3D Touch helps boost productivity. I chose the space gray model, which might be the least prevalent in China where many people consider the gold (along with the new rose gold option) as their first choice. But, as mentioned in a recent episode of ATP, black is for Pro, and I’m really fascinated with the feeling of integrity that the dark screen and frame blend seamlessly with each other. I chose the 4.7″ size for its better single-hand control and lighter weight. I had been struggling with the cramped 16GB storage in an iPhone 5s, so I went straight to 64GB when upgrading to 6 and 6s, which provides me with ample space for all my music, apps, books, and academic documents. And since Apple has generously upgraded their starting tier of paid iCloud storage to 50GB at only $1 per month, now I can put the whole “Academic” folder in iCloud Drive and access it from all three devices without any concern. I only place apps that are launched most frequently on my first screen. For task management, I use 2Do for assignments and projects, Calendars 5 for lectures, meetings, and events, and Due for reminders and trifles. For social networking, I use WeChat (微信), Tweetbot, and Moke (墨客). As you probably know, WeChat is the most popular IM service in China, and it has been expanding to more fields such as payment and O2O (online-to-offline). I somehow dislike it because I feel uncomfortable being tied to a single app, but we don’t have any better alternatives. (I love Telegram, but it’s blocked.) Moke is an elegant third-party client for Sina Weibo. It’s a controversial app that many accuse of being a copycat of Tweetbot in UI and interactions, but nonetheless it’s still the best alternative to the clunky and ads-jammed official one. For content consumption, I use Overcast for podcast listening, and read a lot in Reederand Instapaper. I used to listen to music in some domestic apps (QQ Music by Tencent and Netease Music, but you may not find them in US store due to copyright issues), but I switched to Apple Music when it became available in China, which has a more complete library of classical and cantopop music that I enjoy. For the rest, I use Drafts and Launch Center Pro for triggering actions. Workflow is a powerful tool for executing a series of actions with just a tap (e.g. getting the latest screenshot, cropping it, sharing to friends, and then deleting it). EuDic (欧路词典) helps a lot in language learning, which supports dictionary importing. I’m interested in photography, and the combination of ProCam, VSCO Cam, and Enlight always help me produce great photos. Some stock apps are handy, too. I use Health.app linked with Misfit and Sleep Cycle, as the hub of my physical information; I’m so happy that Notes.app became so functional that I can finally remove the cumbersome Evernote app, and Mail.app is good enough that I don’t need to find third-party alternatives. And, please allow me to show you my Today screens. 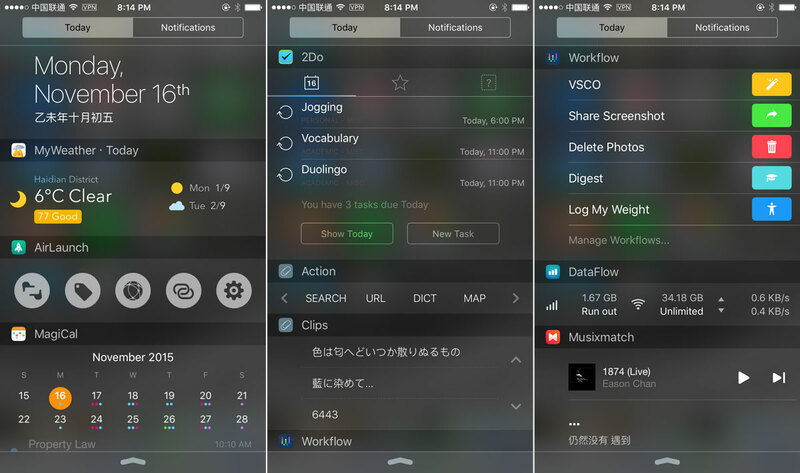 My iPhone can’t be a handy and productive tool without these versatile widgets. Surge. It’s the most powerful and versatile network managing app I’ve ever seen. I didn’t mention it in the previous question because I hardly literally “use” it — it silently runs in the background and proxies all incoming/outgoing network traffic according to your rules. With its help, I can block ads globally, monitor network usage, and bypass internet restrictions without slowing speed while visiting domestic sites, which cannot be avoided when using VPN. I’m really amazed by how seamlessly it works. Editor’s note: Surge was removed from the App Store in mid-November. 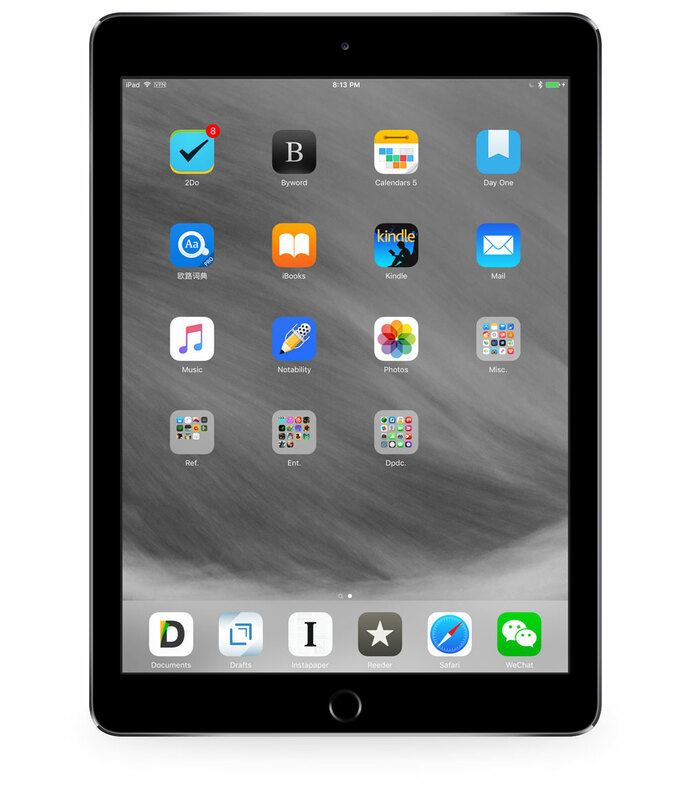 I have a space gray iPad Air 2, 64GB. I also considered an iPad mini, but since I have to read a lot of A4-sized PDFs, a larger screen frees me from frequent resizing. Also, the Air 2’s performance has never disappointed me and I’ll be happy to work with it for another several months until the next iPad Air launches (I’ve tried iPad Pro, but determined it wasn’t for me). If my Mac is for productivity, and my iPhone is for personal management and communication, then my iPad is for content consumption and note-taking. It’s an all-day device for me: during breakfast, I use it to check my RSS feeds and emails. When I attend a class, I’ll pack it with a Logitech Keys-to-go keyboard instead of my MacBook, which is a relief to my shoulders. After class, I organise notes and read law cases and papers on it. 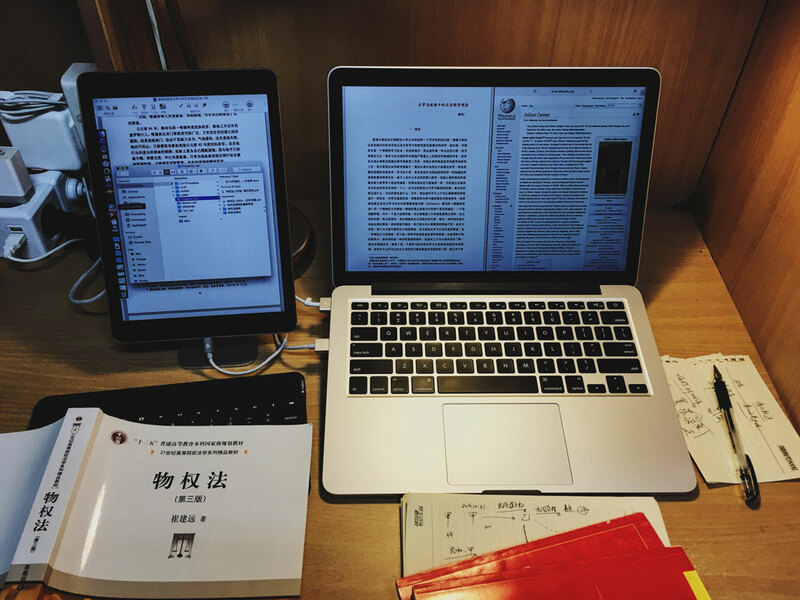 During my work time, I place it on a stand and use it as a secondary display to view reference content and messaging apps. Before I go to bed, I grab it and browse several webpages or iBooks as an evening ritual. My iPad shares most of apps on the iPhone. Documents is my most frequently launched app to manage files and read PDFs, and with PDF Expert installed, it can unlock many useful functions, such as annotation and night mode. Notability is the app I use to take notes and recordings in class, and I’ll organize them later in Byword. All my documents are stored in iCloud Drive for syncing. I enjoy checking RSS feeds in Reeder, and save stories or webpages I’d like to read later to Instapaper. I also read in iBooks and Kindle. If I have some thoughts, I’ll write them down in Day One for further consideration, and it’s also my helper for creating well-formatted emails. 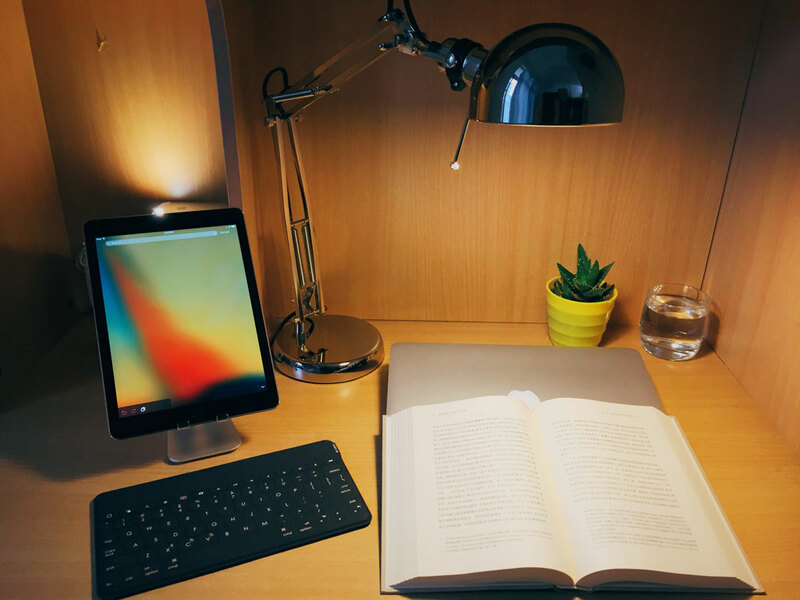 When I need some additional working space, Duet Display turns the iPad into a secondary display for the Mac. I have little time for playing games, but I still keep some gorgeous or inspiring games on the iPad, such as Deemo, Vainglory, and Lumino City. Instapaper. It’s a place where all the articles I’m going to read are stored, as well as all reference pieces that I’ll refer to later. I love to read beautifully-presented articles in it, and with the dark theme, text looks like it’s just floating on the glass, which creates an immersive reading experience.